Spoiler: I know you want to know when to buy BTC and when to sell !! And that’s what exactly we are going to discuss in this article so brace yourself and stick around till the end. Bitcoin is one of the rarest commodities you will on earth. There is only 21 million total supply out which around 4 million bitcoins are already lost and 4 million more to be mined. So effectively you are left with only 13 million coins out there for around 7.5 billion people as of today’s date. But only a fraction of the world’s population know about it and last time it was estimated to be around 35-40 million people (as per the wallet addresses) which is only 0.005% of total world’s population. On the flip side, many who know Bitcoin are skeptical about it and quite a few consider it as a scam too. Many have got their hands burnt also in the meteoric rise and fall of Bitcoin in 2017 and that’s why mostly they have decided not to return. I totally understand their concern and concerns of newbies who want to enter the market to buy Bitcoin. Data shows that a good number of people aren’t really sure when to buy Bitcoin and when not to buy. This happens because there is no standard valuation model available for measuring Bitcoin’s price. And that’s the problem we are here to solve today. For the newbies and veterans both, today we are going to talk about Bitcoin Mayer Multiple, which can give a hint to the investors when to enter and when to pull back from the market. Note: Bitcoin is insanely volatile and this model of valuation is a very high-level one which is trying to put the price movement incorrect emotional perspective. That’s why please don’t consider this a hardline for yourself to buy/sell Bitcoin. What Is Bitcoin Mayer Multiple? Before answering what is Mayer multiple, I want you to know about Trace Mayer, who brought this valuation model out there in the cryptosphere. Trace Mayer, is a very early Bitcoin blogger and monetary scientists who believe in the monetary sovereignty of each individual. That’s he started recommending Bitcoin when it was not even a dollar in price. He coined this approach of ‘Mayer Multiple’ in 2017 to help Bitcoin investors put the price of Bitcoin in correct perspective, atleast probabilistically. Mayer Multiple is simply the ratio of current Bitcoin price by its 200-day moving average. This multiple was proposed by Trace Mayer to put the current price of Bitcoin in a historical context. Of course, it doesn’t tell you exactly when to buy/sell Bitcoin but if used smartly it can atleast give you a hint about the undervaluation or overvaluation of Bitcoin. Now, you must be thinking that with these two data points, how to interpret the valuation of Bitcoin? Well, that’s exactly what we are going to discuss in this section. When should one be a BUYer & When a SELLer of Bitcoin? According to Mayer Multiple inferring this is quite simple, after all, that’s the whole point of having Mayer Multiple in the first place. Historically, the average Mayer Multiple has been around 1.4-1.5 that’s why any price point that gives you a multiple lower than 1.5 is a very good buy. So in light of this Bitcoin is highly undervalued at this time and buying Bitcoin now has a good chance of giving you higher returns in the future when multiple returns to 1.5 or above. Furthermore, the below-shown tweet by Trace Mayer is the most recent one in September 2018 and if you see his expectation of 3000 price levels have come as reality now. But as you can see inaccuracies here, this is not a perfect model of valuation but still can help you put things in perspective in terms of Bitcoin’s price action. Perhaps $BTC crypto-winter will last 6-9 months longer (hopefully! ), touching $3k, but probabilities are getting less favorable of that possibility. Simulations by Trace Mayer suggests that Mayer Multiple of around 2.4 has generated decent profits for investors but I think 2.4 is a bit on the higher side. That’s I would say 1.5 is a fair level of entry and anything below that is highly undervalued. But catching up at 1.5 doesn’t mean that Bitcoin cannot go further down because don’t forget it is a hyper-volatile asset. That’s people who are first-time buyers and are looking up for some indicator to buy Bitcoin, must look at this only when they want to allocate a small capital to this asset. Some people also consider it as a more sophisticated approach of doing dollar-cost averaging. So if you are someone who wants to allocate a lump-sum amount to this asset can think of breaking down that capital amount in parts and start investing as per the multiple every week or month, instead of going all-in with you lump-sum. Well, that’s’ because that’s the prudent way of going and whenever you see Mayer Multiple reaching back to the levels of 1.4, you can turn off your capital allocation to either sell BTC or HODL it. 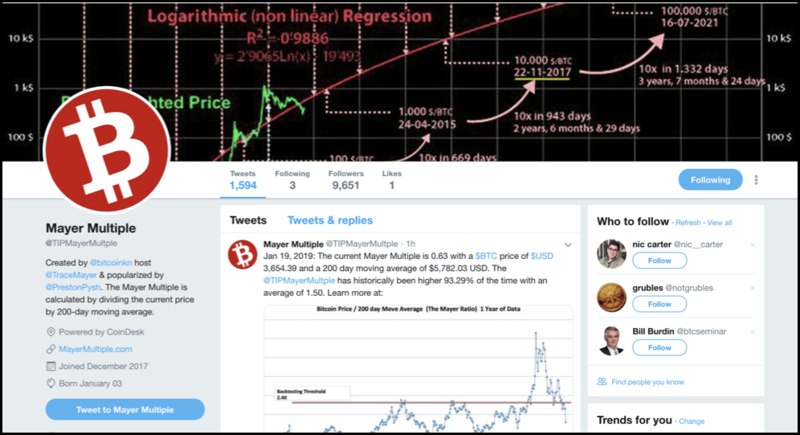 Lastly, you can know the current Mayer Multiple by following this twitter handle which tweets the multiple every day or you can DIY and calculate the Mayer Multiple by dividing the current price by 200-day moving average. So that’s all from our side in this Bitcoin valuation model article featuring Bitcoin Mayer Multiple. There are some more valuation models that have come in the market and we plan to share them soon. Meanwhile, you can follow The Money Mongers on Twitter and help us by giving a shout-out about us in your friend’s group ! !